Ever been to Valencia City? Located on the coastline and packed with so many activities, there are so many awesome fun things to do in Valencia. In Spain, people tend to visit the beautiful Mediterranean pearl Barcelona or the capital, Madrid. Valencia seems to be upcoming, as it is being seen as a real taste of Spain. Valencia has a great location, the weather is good almost all year long, and it is still a hidden gem for international tourism. Local tourism is quite aware of it, but worry not, local tourism is concentrated mainly in August. We have visited Valencia more than once, and can assure you can do many activities. It is a city that will surprise you – in many good ways. We wanted to create also a list with things to do in Valencia. Why? 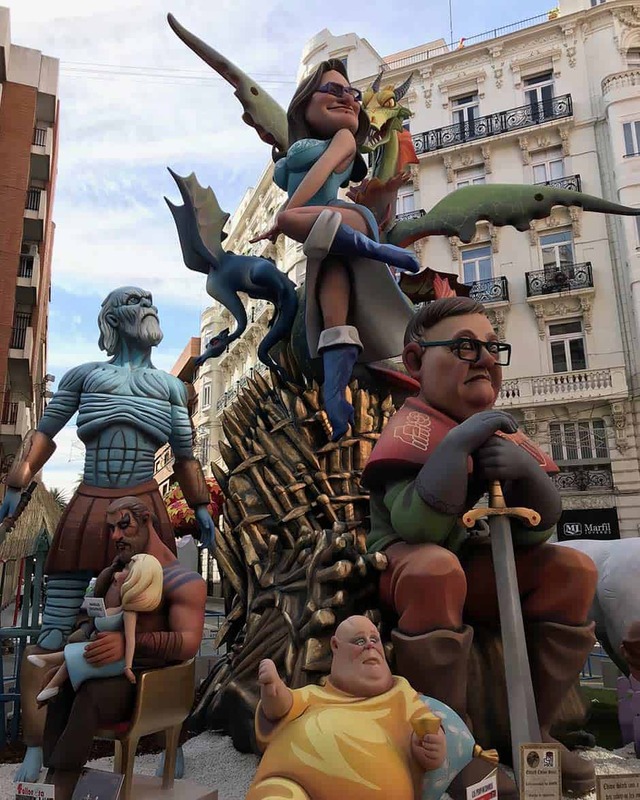 Because Valencia is the place where Paella was born, where Spanish people live happily and one of the biggest and best festival in Spain takes place, Las Fallas. Las Fallas festival is even recognized by UNESCO heritage as a Festival of International Tourist Interest. 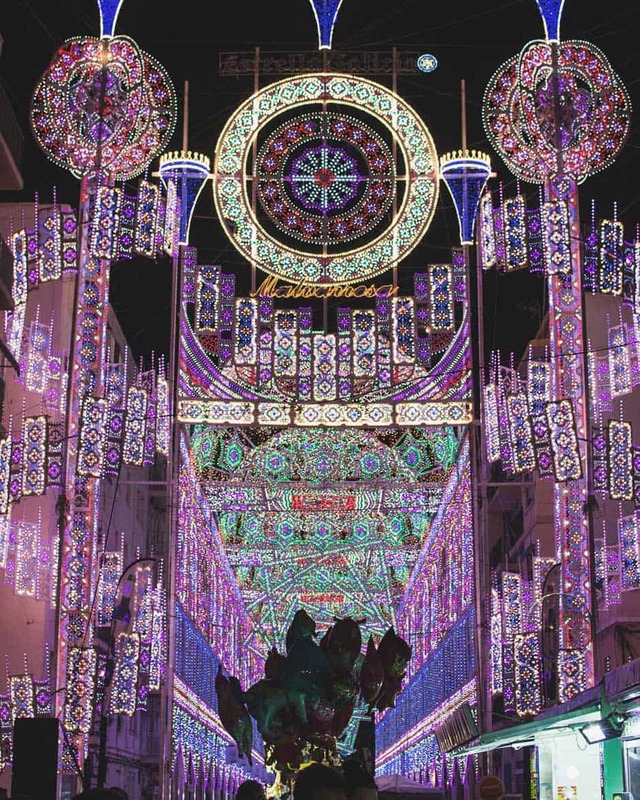 You should experience “Las Fallas” at least once in your life. 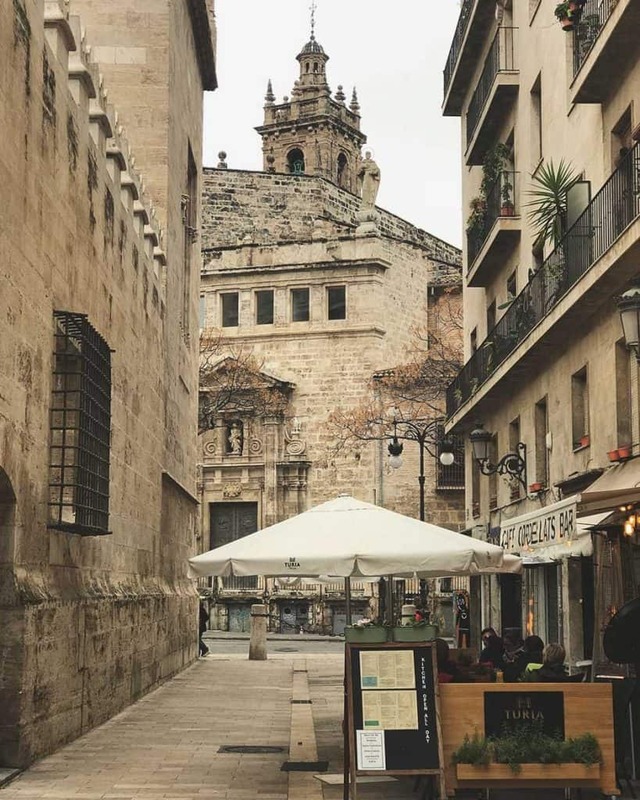 But I don’t want to go too forward, keep here with me and discover all the things to do in Valencia Spain, as well as the things to do near Valencia. 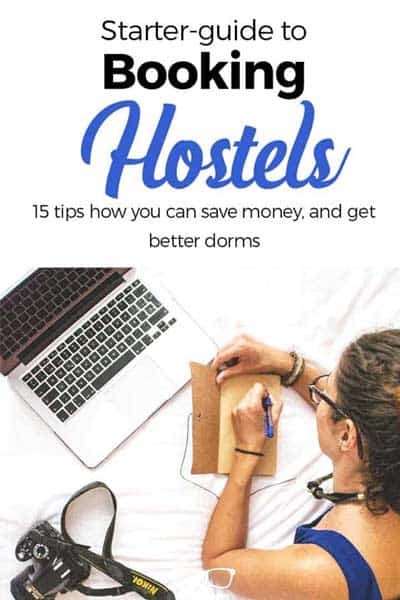 Blame me not, you will start looking for flights right after this list. 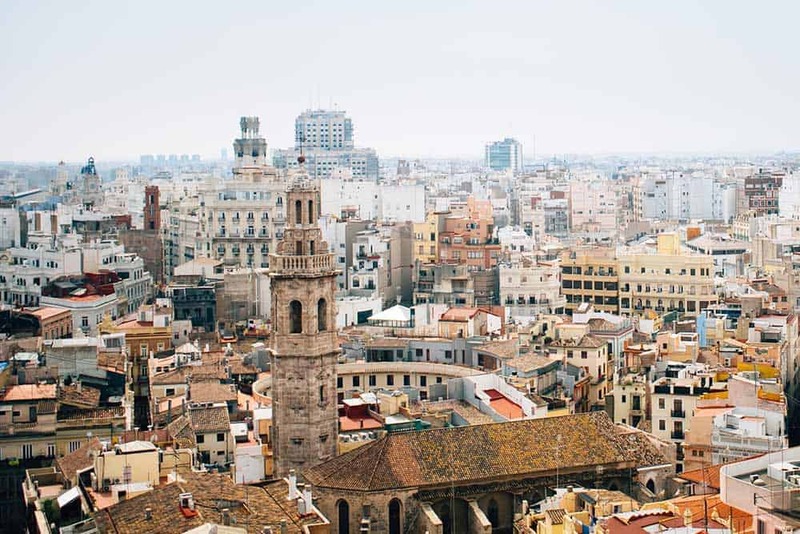 This is our list of the best things to do when visiting Valencia. It covers everything from culinary experiences like food and drinks to water sport, party, nightlife and culture to architecture. 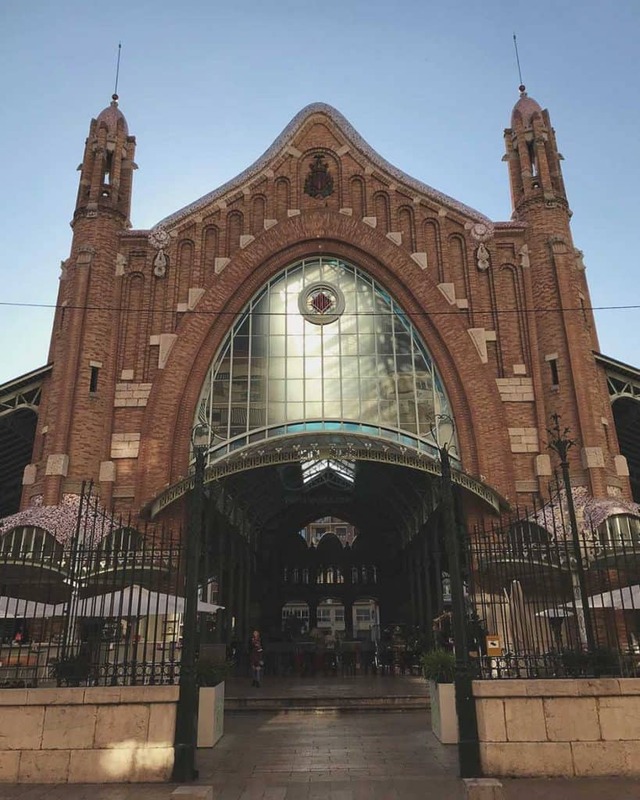 This list also covers great things to do in Valencia with kids. For instance, the Gulliver Park is perfect to visit with the family as well as the City of Arts and Science. I am including also below a specific section with the information about where to stay in Valencia. What is better than eating in a local market? Eating a tasty paella in an old modernist and beautiful market. 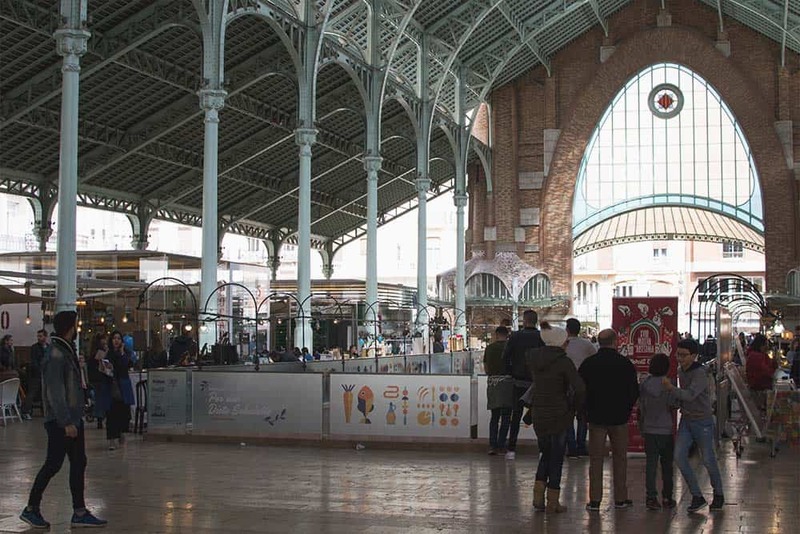 Head to Colon Market, one of the remained main works of the Valencian Art Noveau. With a nice atmosphere and a gigantic fresh air free zone, this old building will delight you. Take your time and order a beer. In case you want to go eating there during the weekend. I do recommend you to try book in advance. You will find the restaurants on Tripadvisor. There is no secret here, the Mercado Central (Central Market) has become very popular and many people go to visit it. While I do prefer less known markets, as Colon Market or Russafa (also on the list), this is one of my favorite places to buy a fresh juice early in the morning. Many different juices made with fresh fruits that are cheap and tasty. Other than Barcelona, Valencia is a perfect city for moving by bike, as it is quite flat. Great weather, many bike trails and cheap bike rentals. Thanks to the bike trailes you do not get in trouble with cars and do not hit any pedestrians. Good thinking, right?! Use them! Rent a bike and join the green movement. 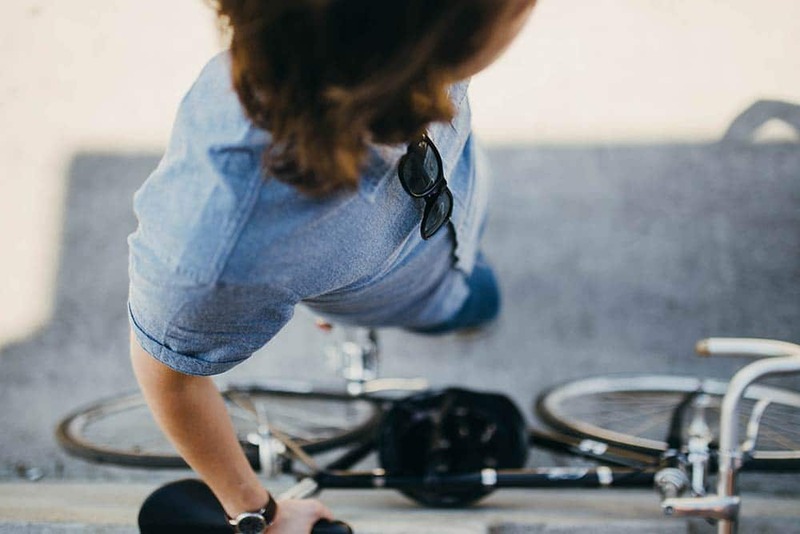 If you do not feel like riding alone along the city, then I recommend joining a bike tour. There are many in the city. I joined this Valencia bike tour and loved it so I can recommend it. Next to the Cathedral you will see a magnificent bell tower. It is one of Valencia’s most iconic landmark, the Miguelete tower. The name comes from the great bell, which is dedicated to St. Michael and still rung – manually! With a heigh of almost 51 meters, it is possible to climb up and get great views of the city. Bear in mind, you will have to climb 207 steps up a spiraling stairway. A bit challenging, but worth it. 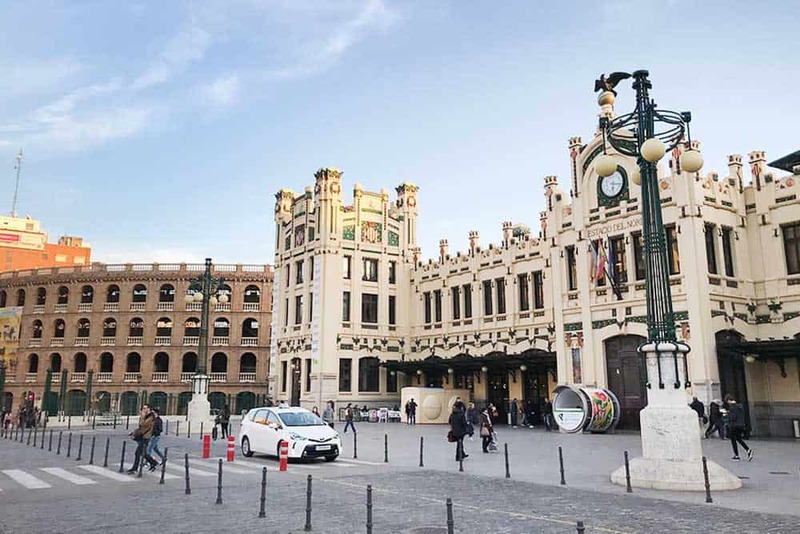 Nowadays a principal tourist attraction in Valencia, the silk market or Lonja de la Seda is one of the main monuments of the city and a masterpiece of Gothic architecture. The silk market was the place to do silk exchange and other trades in Valencia city. Eventhough you cannot experience commercial trading anymore inside the building, the building itself is very beautiful. It resemblances to old medieval castles. Take a picture with the spiral columns, which look like the ship ropes, walk around the orange tree courtyard or simply play with the silhouette and lights inside the building. 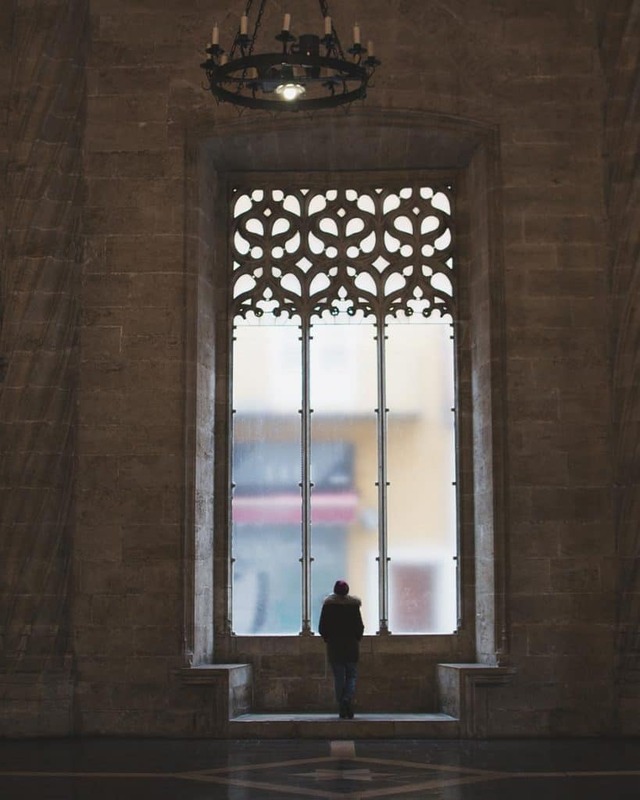 The silhouette of the Lonja and its main façade, which overlooks the historic Plaza del Mercado, is one of the most attractive and architecturally important corners of Valencia – really instagrammy too. Wanna learn more about this place? With a beautiful setting right on the beach, Marina beach club is a place where some high class people in Valencia fancy go for a lunch on Sunday. This club do offer Japanese Mediterranean fusion food. If this kind of food is not for you, you can just enjoy a poolside bar that looks fun right on the beach. This place has EPIC parties during summers season. A visit to the City of Arts and Sciences is a must while in Valencia. Even if you only walking around the outside area. Located at the end of the former riverbed Turia, Ciutat de les Arts i la Ciéncia is an architectural complex with several buildings. Some of these buildings have become icons in the city. This project was originally budgeted at €300 million. It is said that it has cost nearly three times the initial expected cost. 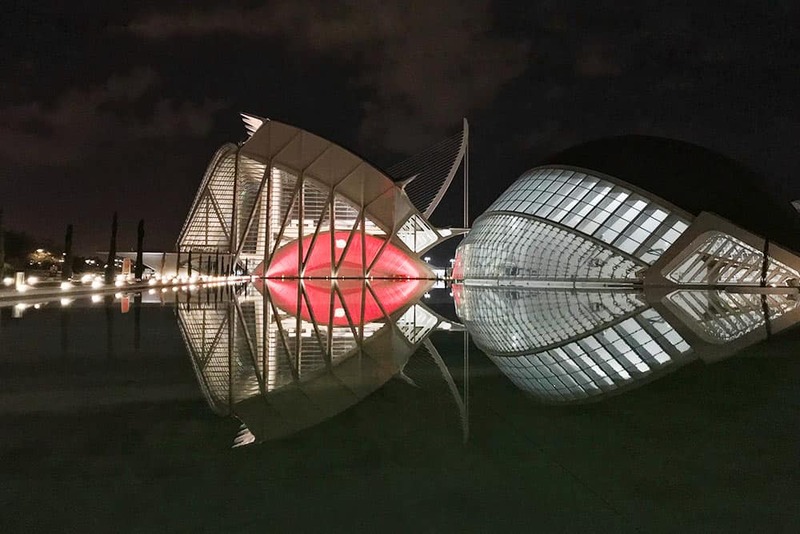 It is designed by Santiago Calatrava, an important and recognized architect born in Valencia, together with Felix Candela, a great influence on Calatrava’s works- he was his teacher. This building is meant to resemble a giant eye and it certainly does. Its design resembles an eyelid that opens to access the surrounding water pool. This building that resembles the skeleton of a whale hosts an interactive museum of science. Built over a car park, the Umbracle is an open structure enveloping a landscaped walk with plant species that change colour with each season. All the spices are indigenous to Valencia. You can find rockrose, rosemary, lavender, honeysuckle, orange trees, bougainvillea, and 99 magnificient palm trees. This building holds many events such as opera, theatre and music in its auditoriums. A white cable-stayed bridge crossing the dry Turia riverbed. The tower of the bridge is the highest point in the city, at 125 meters high. A covered square in which concerts and sporting events are held. A cool option for exploring the whole Arts and Sciences area, is joining a seagway tour. Oceanographic is a great venue for a special occasion. Imagine this, you can eat in a restaurant having the oceanographic views. Meaning, you will be eating surrounded by fishes. It is a bit pricey, but you pay for the experience. If you decide to go to oceanographic to eat, bear this in mind: it is more about the experience than about the food. I just wanted to mention it because food is not the best in town. Considered by historians as a paragon of nobility and opulence, Palacio del Marqués de Dos Aguas is currently owned by the Spanish State. It was a nobility palace historically important in the city. You will find some interesting ceramics as it host the porcelain museum, but the real jewel is the palace itself with the amazing external facade and the rooms. While Paella is the most desired dish in Valencia, Orchata is the traditional drink. And both are originally from Valencia. Orchata is a sweet, refreshing drink made with tiger nuts called “Chufa”. It tastes similar to almond milk. 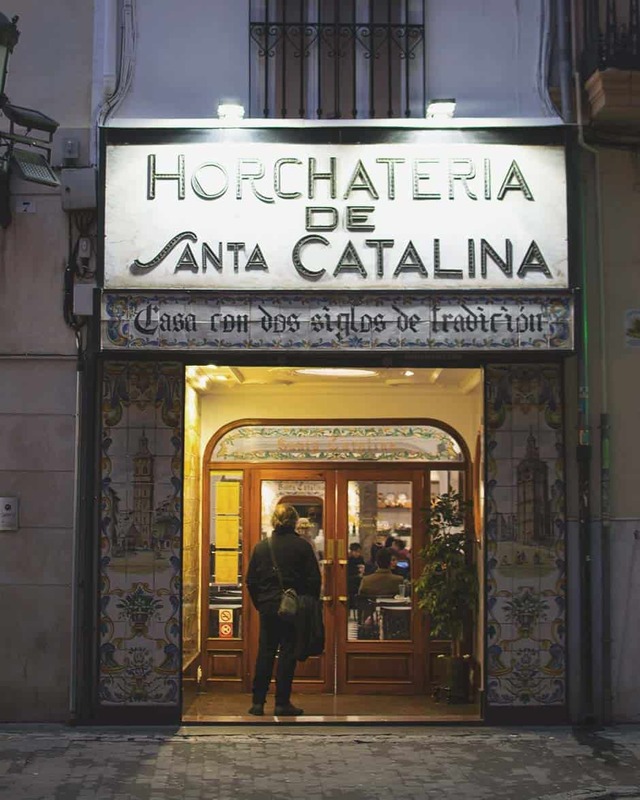 As Valencia is the home of horchata, if you are in the city you must try it! And the best place to sample it is at the Santa Catalina. 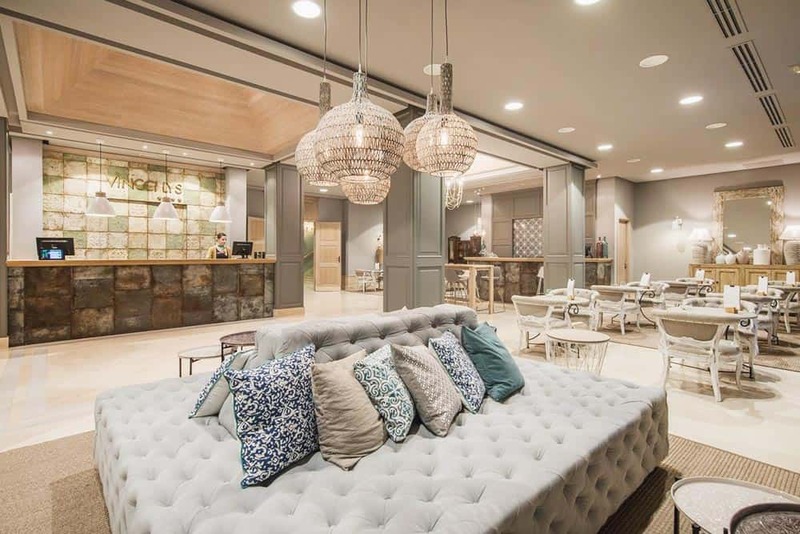 The underwhelming entrace will lead you to the historic interior, with its traditional décor and seating. Santa Catalina is slightly more expensive than buying from the vendors on the city streets, but the experience is highly recommended. And you can take this chance to go to the bathroom too. If you are not sure you will like Orchata, buy one and share it. The real Valencians (people from Valencia) drink orchata together with Fartons, a traditional pastry. When ordering Fartons, make sure you dip them in the Orchata! Curious about the process of this tasty drink? Visit the tigernut fields and join a workshop before you enjoy a Horchata tasting. Book your Orchata workshop here. Torre de los Serranos is one of the twelve gates that formed part of the ancient city wall. It was the main entrance to the city and it was originally built with a defensive function. It is one of the best preserved monuments of the old city of Valencia and nowadays you can go up and enjoy 360º views over the city. Note: The journey up is only for those who are able to walk up lots of stairs and aren’t scared of heights. 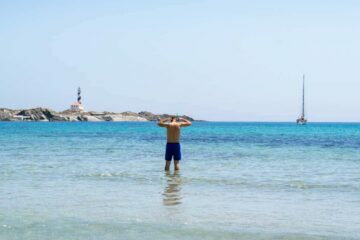 What about paddle surf on the Mediterranean sea? The water is quite flat in Valencia, so it is fairly easy. Directly on Malvarossa beach, you will find the guys from Ocean Republik, who offer windsurf and paddle surf classes. Bio park is an Immersion Zoo which can be reached by tube train in Valencia. You just need to take the line 1. Even-though I do not support zoos, Biopark has a differnet concept with a different design and layout. On the first part some animals are just roaming freely and guests can get very very close. In that section, animals are allowed to mix with those they would encounter in the wild so, for example, the Savannahs area hosts elephants, giraffe and antelopes as well as rhinos and zebras. Then you proceed to the rest areas, where the more dangerous animals are behind glass or water. The animals are put in an ambience similar to their natural habitats, not just in cages. History geeks! 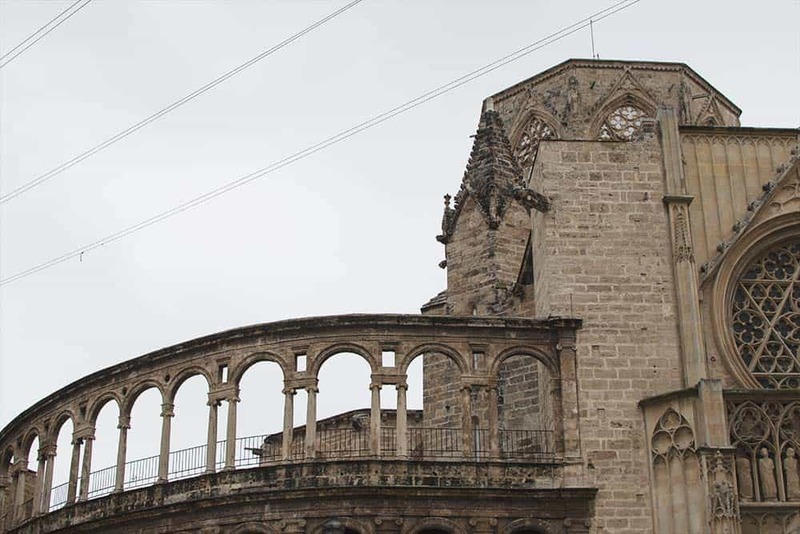 Do you want to know every detail about the medieval town in Valencia? Then join an historic walking tour. You will hear all tales of the city’s, curiosities from the middle ages and go through more than 2000 years of history. At the end of the tour, you can ask as many questions you want. One of 2 surviving gates of the old ciy walls. 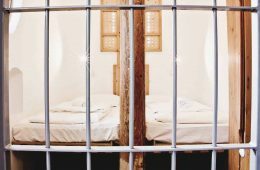 The building has been used through the centuries for different purposes, such as military prison. You can climb to the top for a fee but to be honest the Torres de Serranos views was our preferred view. 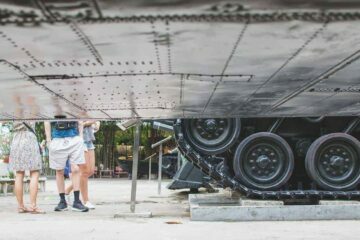 Nevertheless, it is worth it to see them and notice the bomb impacts on the walls. Tip: on Sundays, entrance is free. Not so far from Valencia, you find a tiny island, known as the flat island. The island is indeed totally flat! Tabarca island can be reached from Valencia or Alicante, it is around 15 km southeast from Alicante . It has less than 50 permanent inhabitants, and the island is known for its abundant Marine Life and its only and beautiful sand beach (which tends to be very full in summer). Tabarca is a great spot for snorkeling or even a diving. 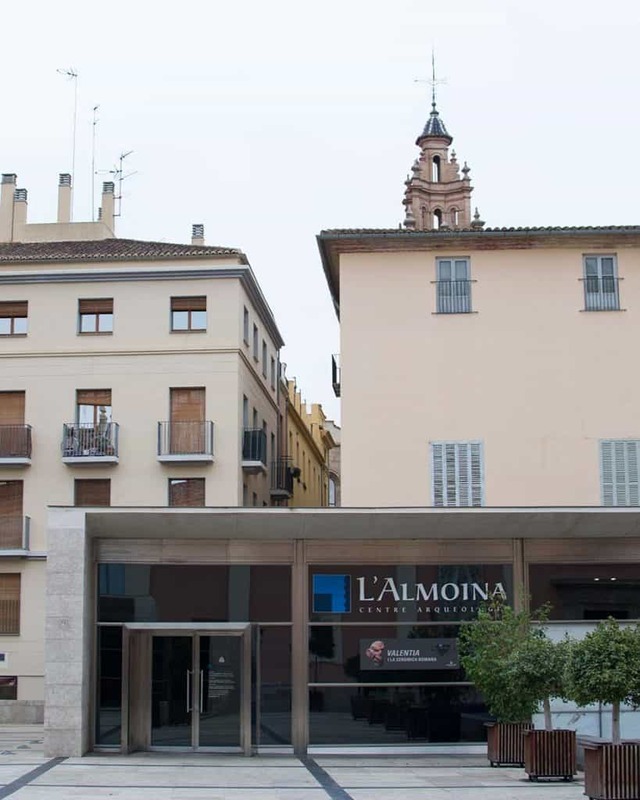 This archeological center Almoina is not only for history buffs. True, it is very rich in archaeological treasures, but it is well presented. This center shares understanding and interpretation of the prehistoric world. It has also has Roman and Islamic foundations and finds. You will be able to see from the relative sizes of the various human species, to a beautiful presentation and description of cave art, to a great illustration of stone toolmaking. You will be walking (with just a glass floor between the ruins and your feet) through the Roman crossroad. Note: The lighting is low so watch your step. Even-though we do not personally support it, I had to mention the Bullring in Valencia. Why? Cause it is the 1st class arena in Spain and it’s still a part of the culture. I had to mention it to have this list as useful and complete as possible for you. 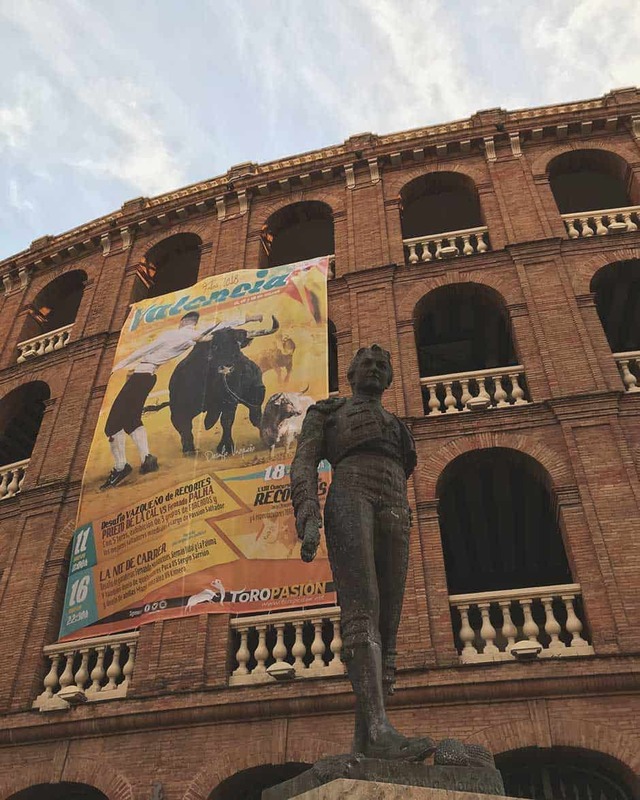 The bullring in Valencia is hosting the most important event programming internationally. 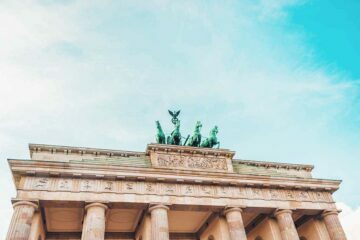 It is also one of the most popular and representative Monuments in the city. If you are curious about bullfighting, there is a museum inside. For a small entrance fee you can enter to the arena and the museum. You will be able to walk around the bull ring and have a look from the sitting area. Between all the shiny traditional costumes and items used in the spectacles (which won’t take you too long to see) you will also find a video about the bulls and his life to death process. If you are considering to watch a bull fight, be aware that depending on the fighter coming to the ring, tickets will be sold out quickly. You can get all the program at the official Valencia Bullring website. 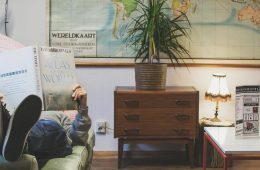 Where to find tickets? Here you can find this years schedule, prices and tickets. Personal note: We are not fans of bull fights neither animal abuse. Located in the old river bed of the Turia, you will find the Music Palace. The building was built specifically to promote culture, and it hosts concerts, operas, ballets and even educational activities. The most distinguished features of this building is the glass enclosure that looks out on the Turia Gardens. From there, you can watch the Turia fountains. These fountains were designed to spout to the beat of the music plaid at the Music palace. More information at Palau Valencia. Just in the middle of the city you can find the Botanical garden. A real oasis on a hot summer’s day, as the building has been designed with many shade points. The Botanical gardens are really well laid out: indigenous regional species with this work are sitting alongside a large collection of species from around the world. Well worth taking time out for a visit in a hot day. Have you ever had the wish to throw a tomato into your friends face? The TOMATINA Festival is one of the worlds most famous festivals. One of the coolest things to do in Valencia in summer! This is exactly where you can fight by throwing tomatos at your buddies and strangers. Even though theis Tomato party is held in Buñol, around 35 km from Valencia, most people who attend this festival stay at Valencia. At this festival, participants throw tomatoes in a controlled Spanish chaos and get involved in a tomato fight. The tomato fight is purely for entertainment purposes. It happens the last Wednesday of August, so if you ever wanted to throw a tomato to your friend’s face, put it on your list! Tip: Wear old clothes that you are not planning to wear again. 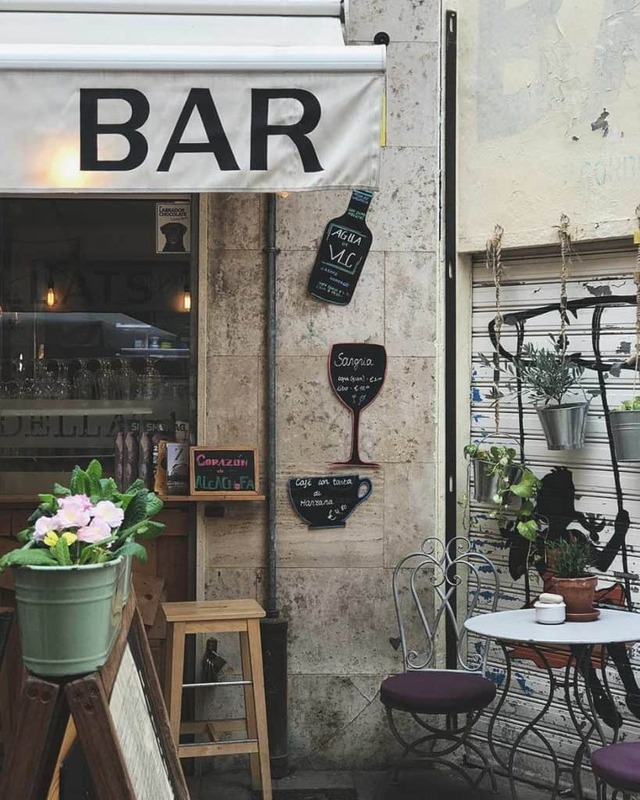 This café is a real gem in Russfa, which is one of the trendiest neigbourhoods in Valencia. ArtySana Café is beautiful cozy café to unwind whilst grabbing some great, healthy food. Their selection of avocado tostadas and cakes are tremendous. The owners love art ,that is why, you will see many expositions from different artists around. The collections change quite often, which is refreshing. They do also love music, that is why you might find yourself in a private concert (normally Friday or saturday nights). Note: If the weather is good, go sitting at the outside terrace. We mentioned it before and here it comes again. In Valencia, you can taste the Spanish culture, and there is nothing more Spanish than… Churros! Normally,young people do eat churros after a long night partying, and that means at 6 o’clock at least, when the Churrerias (churro shops) do open. For those wo party days are left behind, it will be your sweet treat of the weekend. You will find many churro places, but one of the best is Horchatería el Collado, near the central market. 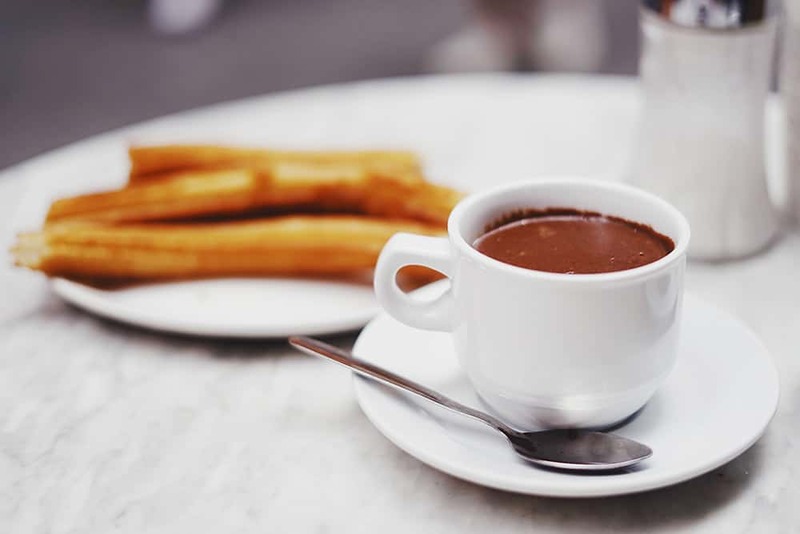 The best way to eat churros is order also hot chocolate and deep them in the chocolate. If you already tried churros, you should try Buñelos, which is the most local expression of this sweet tight. 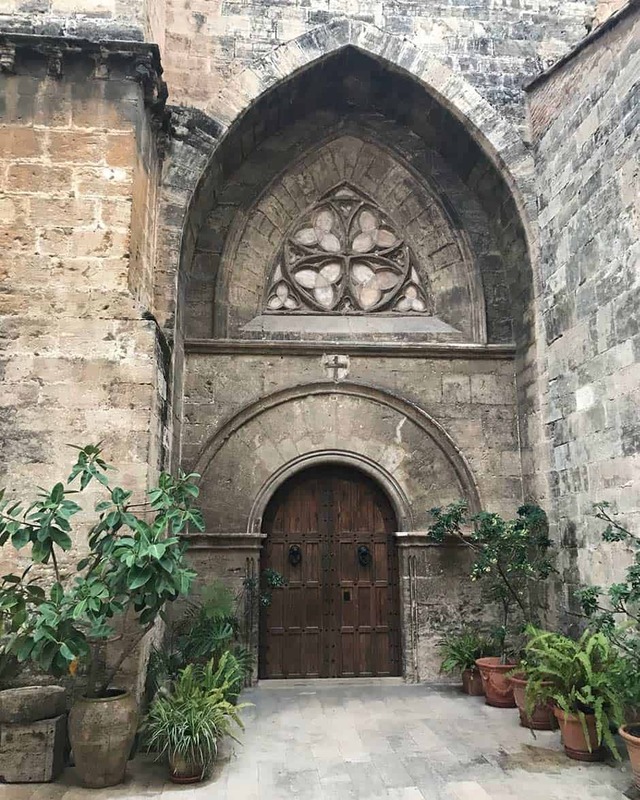 Built in the early 13th century, Santa Catalina is a Gothic-style, Roman Catholic church located in the city of Valencia. You can climb up the 120 or so steps winding your way to the top, where you emerge through a sort of trapdoor to see a very nice view of the city. 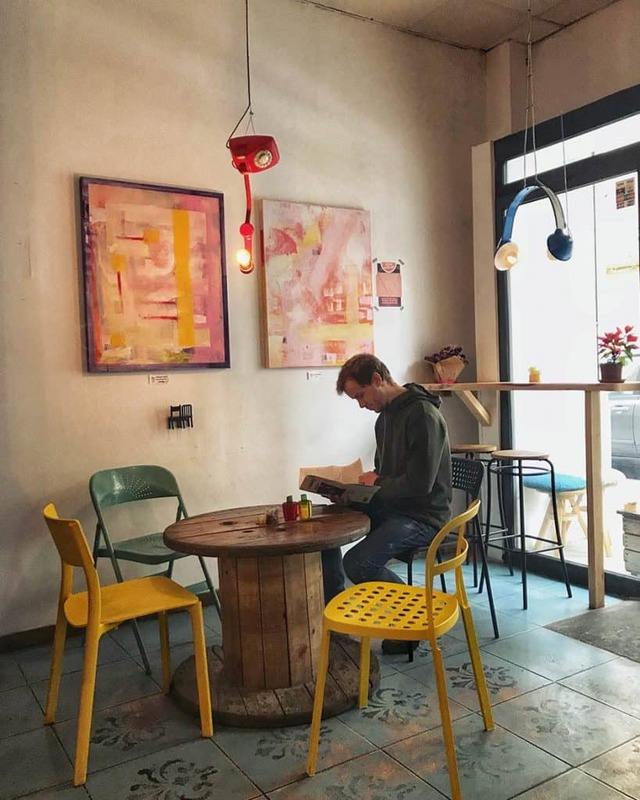 Ubik café is a unique place where you can enjoy a wide selection of artisan beers, tasty tapas or sip a coffee. The café is designed as a bookstore. Nevertheless, you are not allowed to bring the books to the table (at least not if you don’t buy it). You can also find art expositions or even live concerts. Have a look at the Ubik cafe site. 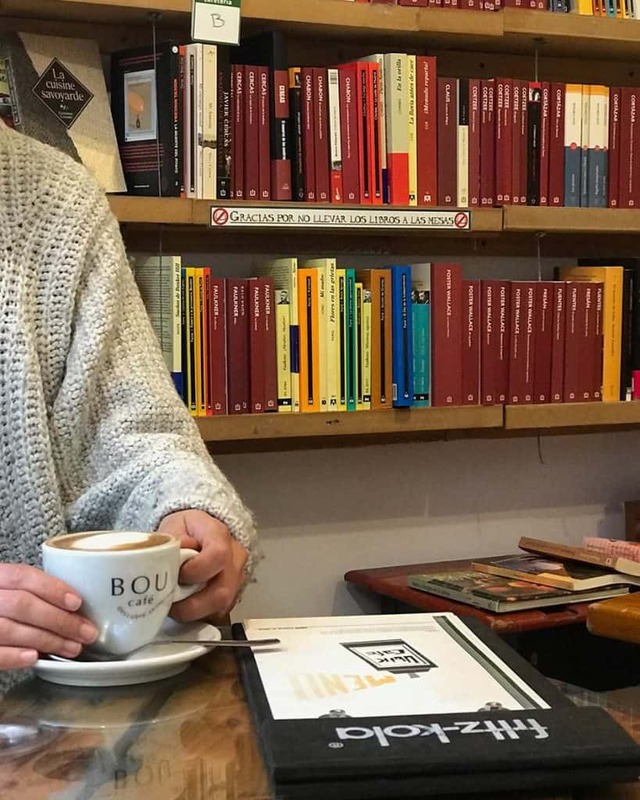 Good to know: when donating books to the UBIK cafe, they will invite you for a drink! Did you know that you can see the narrowest building in Spain, and Europe, is located in Valencia? I did not know it neither until I was there last time. 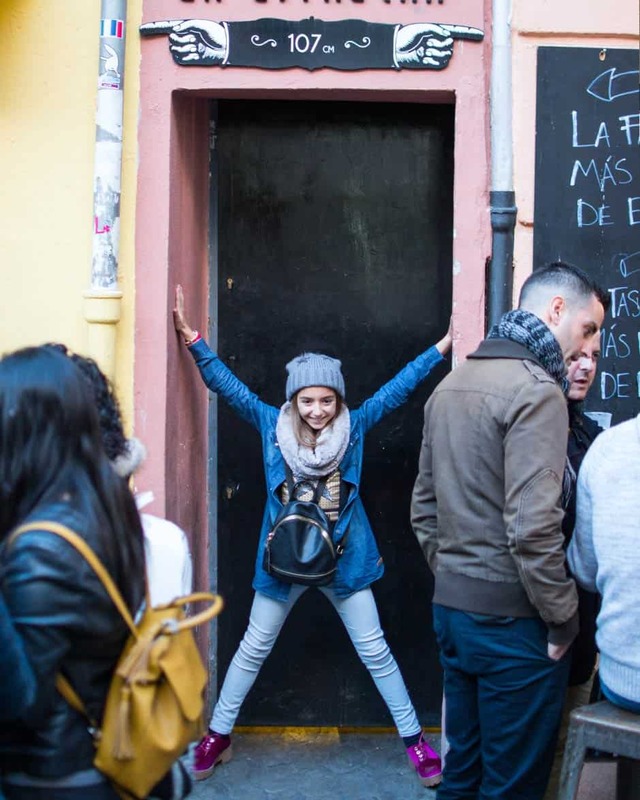 With just 1,50 m, the bar La Estrecha is claimed as the narrowest building in Europe. This bulding give the name to the bar nearby, where you can stand or sit at high tables outside to drink wine at reasonable prices and have a great selection of tapas. As Valencia is evolving as a city and becoming more metropolitan each day, their streets are changing. They are busting with creativity, filling the streets with politically charged graffiti or also murals. 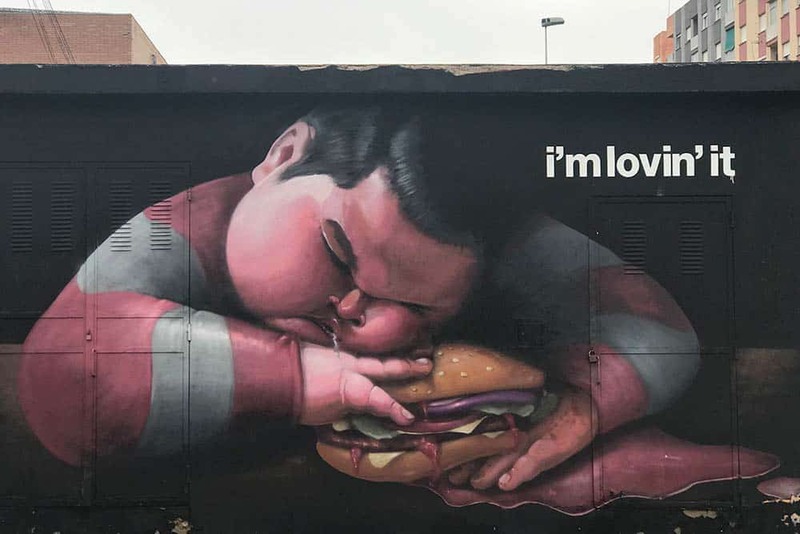 If you are curious about the Valencian street art, I do recommend you to join a street art tour. There, you will hear about the street art evolution and sample not only information but also some traditional drink. If you ever wanted to try segway, I do totally recommend Valencia for it. It is a flat city, which makes it extremely easy to drive along with the segway. As simply renting a segway is not possible, you must join a segway tour. In this tour you will have an hour-long ride through the historical old town. 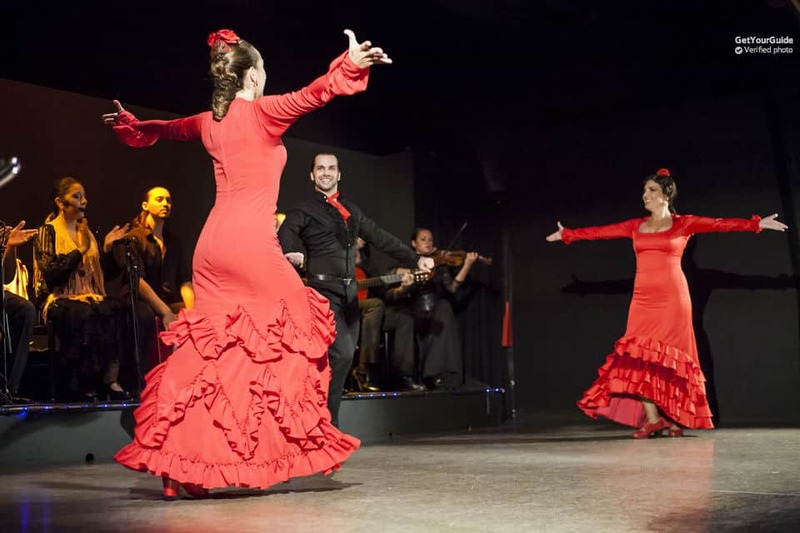 If you wanna experience all the Spanish culture, you cannot leave Valencia without visiting a Tablao flamenco. Even though this folkloric dance is from Andalusia area, you can find a great show in Valencia. In this Flamenco experience, dinners (with Sangria) is included. A different way to feel the passion of this powerful music while enjoying a delicious dinner. 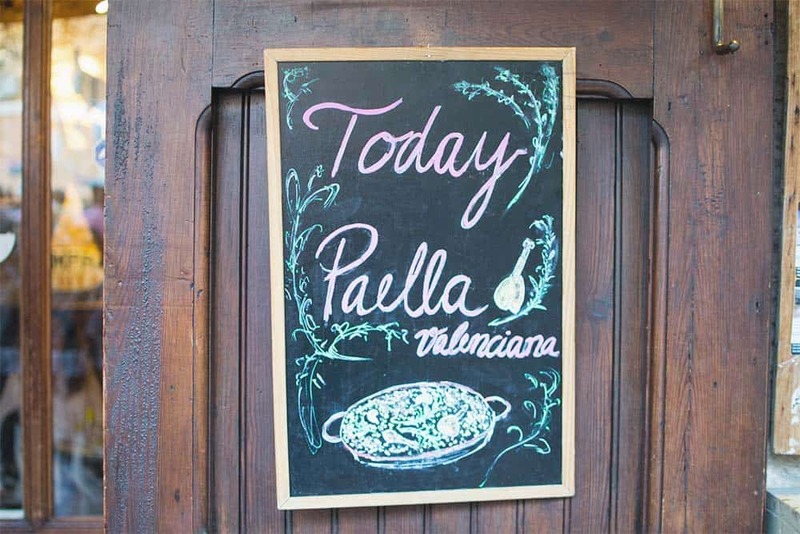 Probably Spain’s most famous dish, you might be surprised to discover that paella was first created in Valencia. Then Valencia is the place to taste the real one! Be aware the traditional paella comes with a variety of meat, rabbit and in some cases even snails. You can always go for the seafood version, with prawns and squid. Or even a vegetarian. The name of the dis comes from the large iron pan where it’s cooked and served, which is called Paella in Valencian language. 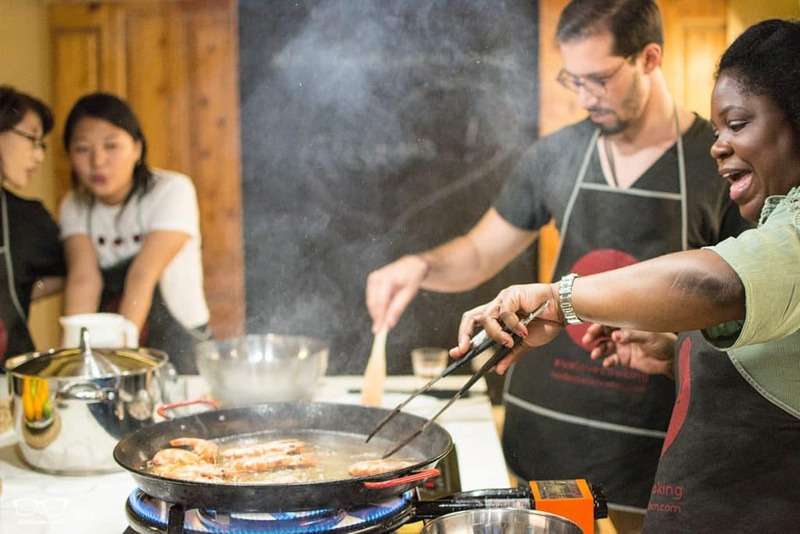 If after devouring a Paella you feel is not enough, then join a cooking class. and tips and tricks to cook is as the Valencian people cooks. Afterwards, you will eat it together with your cooking mates. 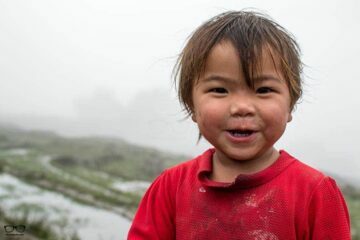 It is also a good way to meet other like-minded travelers. A good way to take advantage of the time and be able to see more things in Valencia is to rent a scooter. This is helpful if you are planning to go to the beach, and many other places. If you just want to be around the city center, just a bike or by walk will be enough. With roots dating back to the conquest of Valencia in 1238 and the Knights, San Juan del Hospital church has a long and checkered history. There was a period of dereliction that almost lead to its complete destruction. 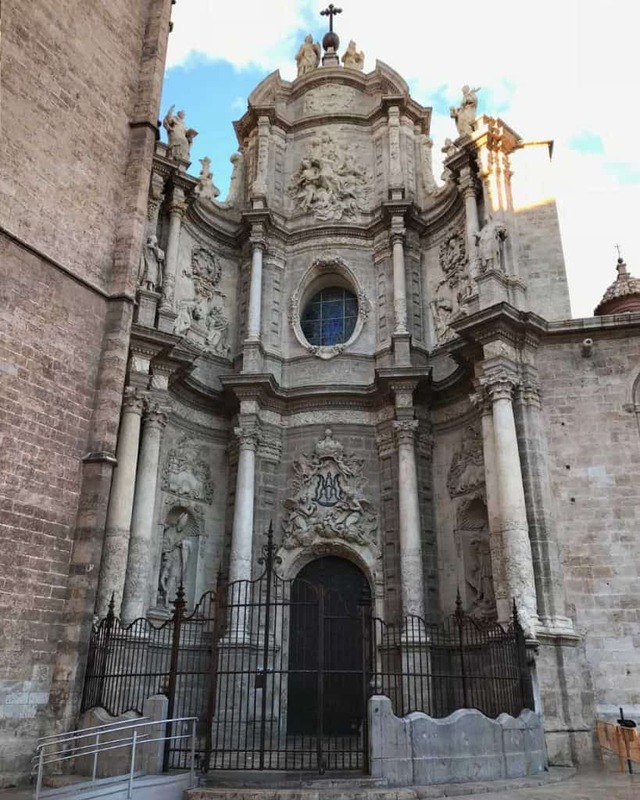 It is Valencia’s oldest church, and it is well worth seeing. Hidden between the buildings, it is a modest but incredibly dignified church. If you are a football lover, try to get some tickets to see Valencia playing while you are visiting Valencia. The Stadium is a temple of Spanish football. So if you are a football fan, make sure you don’t miss this experience. Bhe atmosphere is nice and it is very easy to get to the venue as it is near a metro (subway) stop. You can buy the tickets at the official site of FC Futbol Club. For real Valencian supporters, be aware that they do also offer guided tours. Located in one of the trendiest neigbourhoods, you will find a very traditional market. 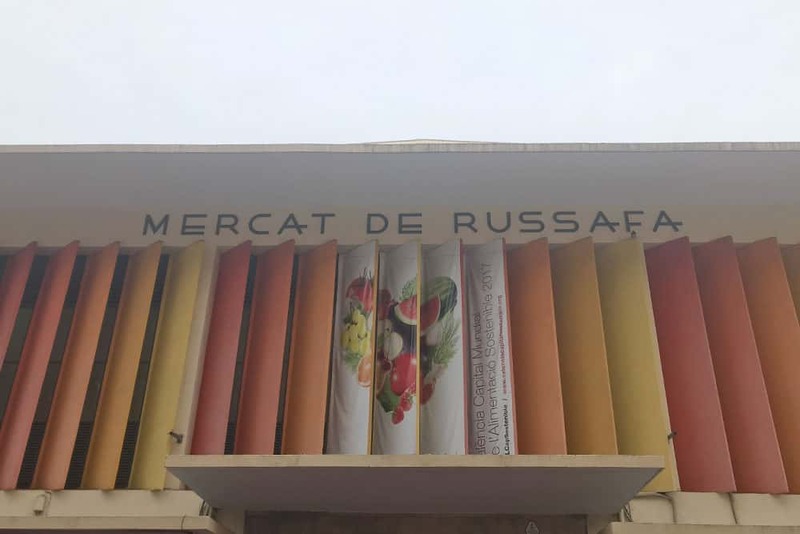 Russafa Market is the place for buying food. 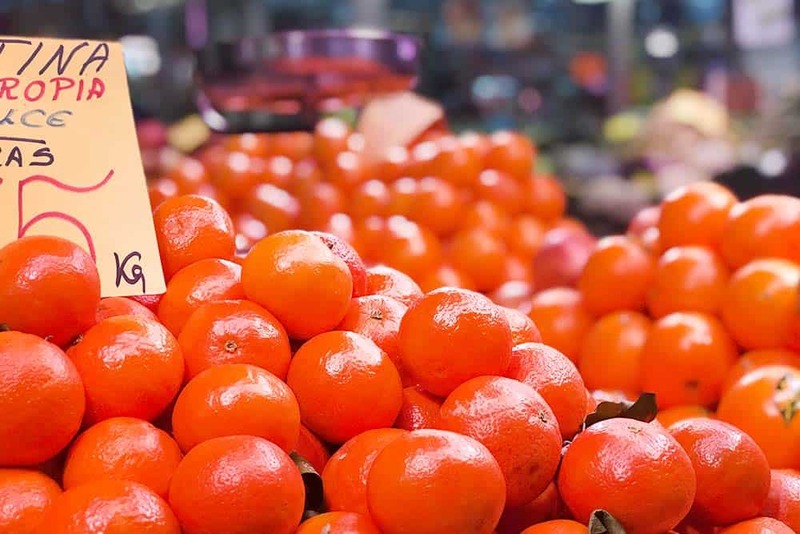 It has everything you can find on the central market, but cheaper. There are plenty of Valencian residents shipping in here so you can see the daily life. That makes it a nice place for those who enjoy people watching. The building of La Nau Cultural center in Valencia University is a fine example of Valencian Neoclassical architecture. 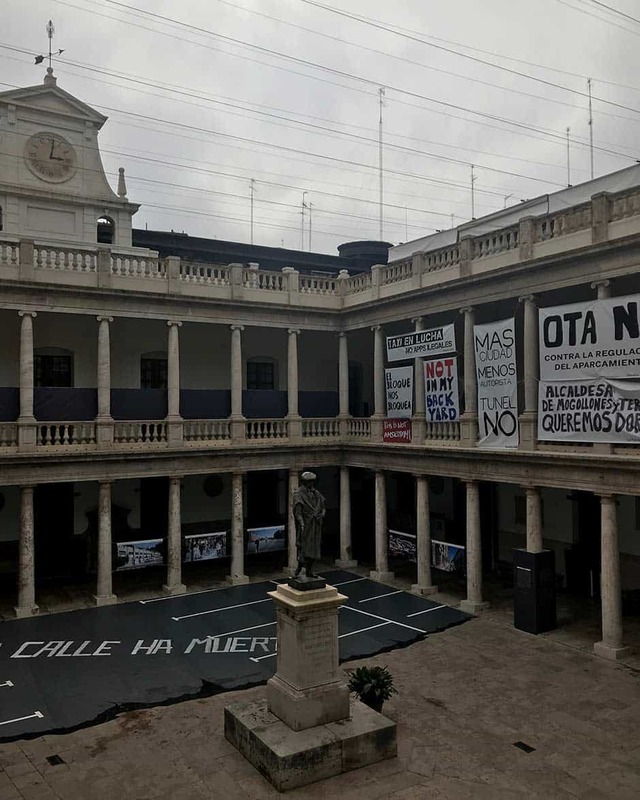 You will find a cloister, old façades, and interesting exhibitions, as it became a point of reference for the cultural and institutional activities of Valencia University. Valencia has also many free things to do. 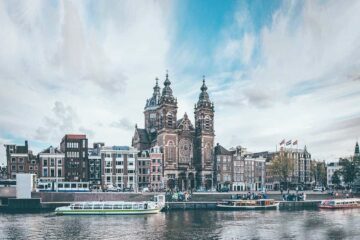 It is a city that can be visited no matter which your budget is! You will find many students around Valencia, as it has a big University. It is also quite trendy to do a language course in Valencia. Carmen neighborhood is one of the most central neighborhoods in Valencia. It took shape in medieval times. You can see pieces of Valencia’s late-medieval defenses, as Torre de los Serranos, walk along the alleys full of hip boutiques, bar and restaurants, or even go out! Eventhough it is right in the city center, Carmen neighborhood is home of different nightclubs. Plaza redonda is one of Valencia’s most unique tourists attractions. This is due to its peculiar design. It is a circular square. Constructed by Salvador Escrig Melchor in 1840, plaza redonda was a bustling fish market. Restored in 2012, nowadays this circular square is filled with embroidery stalls. The traditional embroidery stalls contrast with the refurbished style. Tell us about how you like or dislike it in the comments below. Inspired by Gulliver’s adventures, you can find a Gullivert park in the middle of Turia Park. Get your lilliputian adventure at these park while having fun in its slides, ramps, stairways and all kinds of little interactive features. You will also find a skating area, a giant chessboard and a mini-golf course nearby it. Not wonder here, every Spanish City has a cathedral and Valencia has one too. The fascinating part about the Valencia Cathedral, is the Chapel of the Holy Chalice. At the altar, you will find one of a few chalices claimed to have been used by Jesus to institute the Holy Echarist at the last super. Even though it has been claimed, there are still no proofs that it was really used. While Playa de la Malvarossa is the most known beach in Valencia, Valencia has more beaches around. 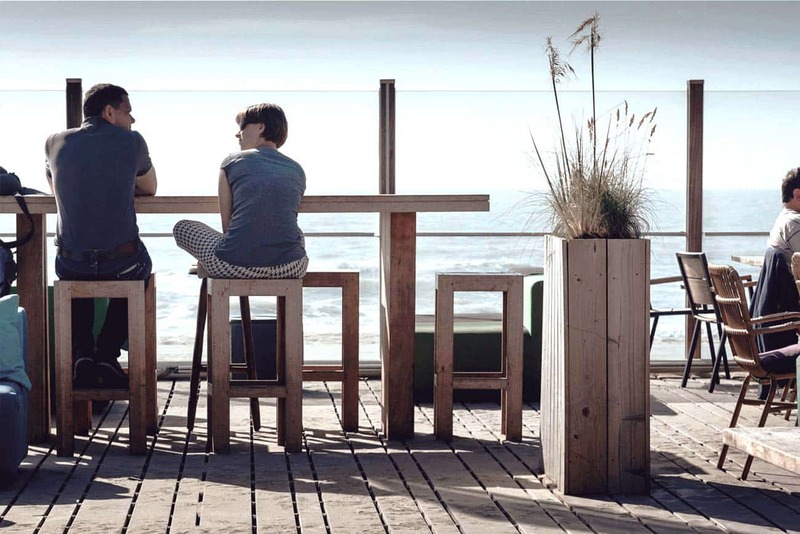 El Saler, which is just nearby, is the place to go if you want a more natural setting for your day. Sand dunes and pine trees on the back, moderate waves (it is the Mediterranean sea) and a quite ambience. It will be hard to go back to your accommodation once you enjoy this freedom sensation called… nature. The train station might not be interesting as a first sight, but as it is in the heart of the city you will go by. It is located just next to the bullring. The building itself is one of the main works of the Valencian Art Noveau and it was declared Goof of Cultural heritage in 1987. Therefore, why not giving it a second chance having a larger look? I do recommend to have a glance at the interior too, as the decoration of theh vestibule is also beautiful. 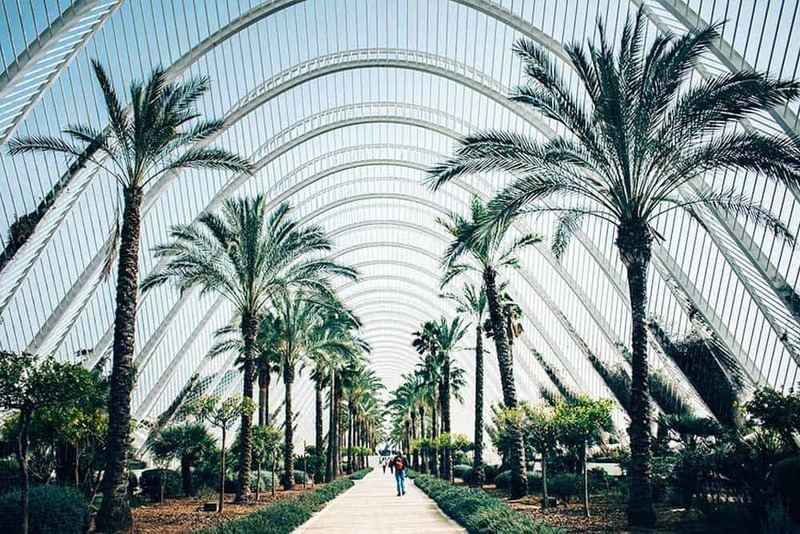 The biggest park in Valencia, with more than 150 hectares, is an astounding lineal park that will brink you relaxation and fresh air in the middle of the city. The park used to be a river, but the Turia river burst its bank in 1957. The riverbed has been converted into this beautiful park. You can still see and cross 18 bridges that still cross the riverbed. The oldest bridge dates back to the middle ages and it is a very known place for Instagram photos. In the park, you will find the Gullivert park, orange groves, palms, and paths that lead to sport facilities, play areas and fountains. It will also lead you to… Ciutat de les Arts i les Ciencies. Within minutes of the old-town you could be sunning yourself on a Mediterranean beach, playa de la Malvarrosa. It is a wide strip of golden sand that stretches for a kilometre along the city’s seafront. There are permanent restaurants right on the promenade next to the beach, so it is a perfect spot for a Spanish aperitivo. And now that you are in Malvarossa beach, what about trying something exciting and new? Near Malvarorsa beach, you can experience flyboarding. It is anew activity where you ride a board that is connected to a water hose which expels water at huge pressure. That allows the board to rise over water up to….12 meters! Rise over the water and feel like a Hero! 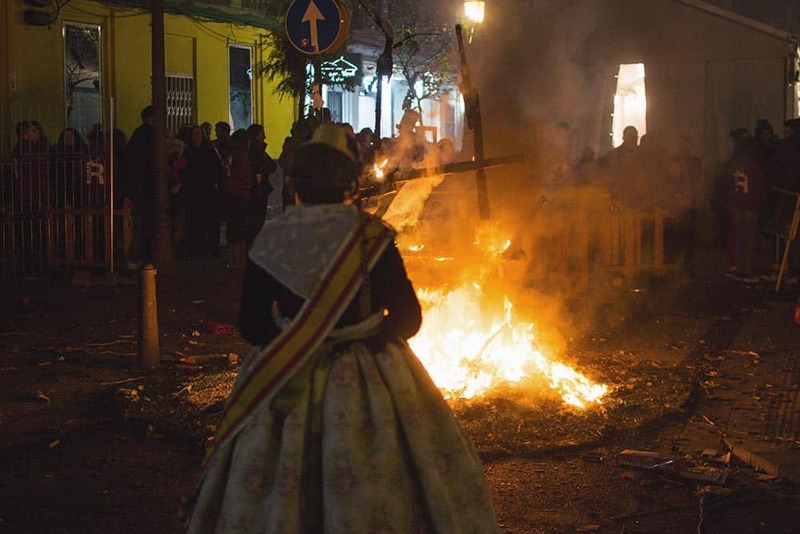 Every March Valencia gets ready to welcome the spring with their festival Las Fallas. It is one the most international parties in Spain, as it is officially an UNESCO cultural heritage of Humanity. 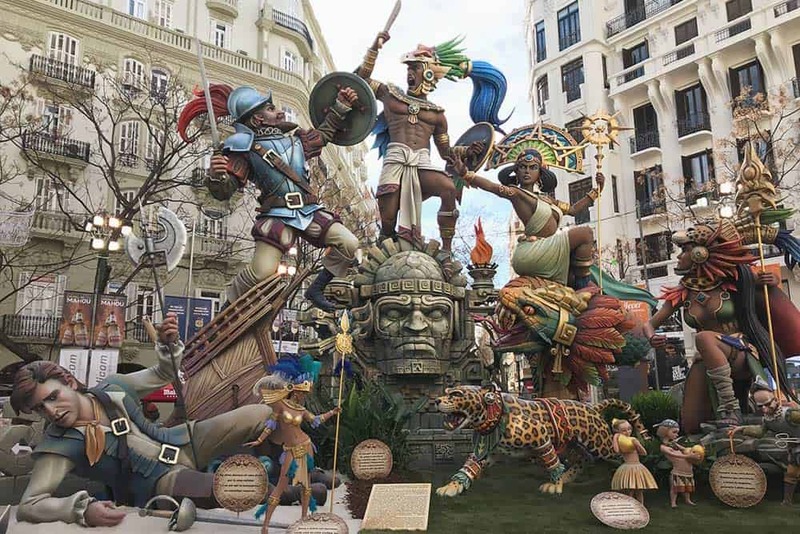 In Las fallas, the protagonists are enormous figures known as Fallas that are displayed on the streets during from 15th to 19th March. 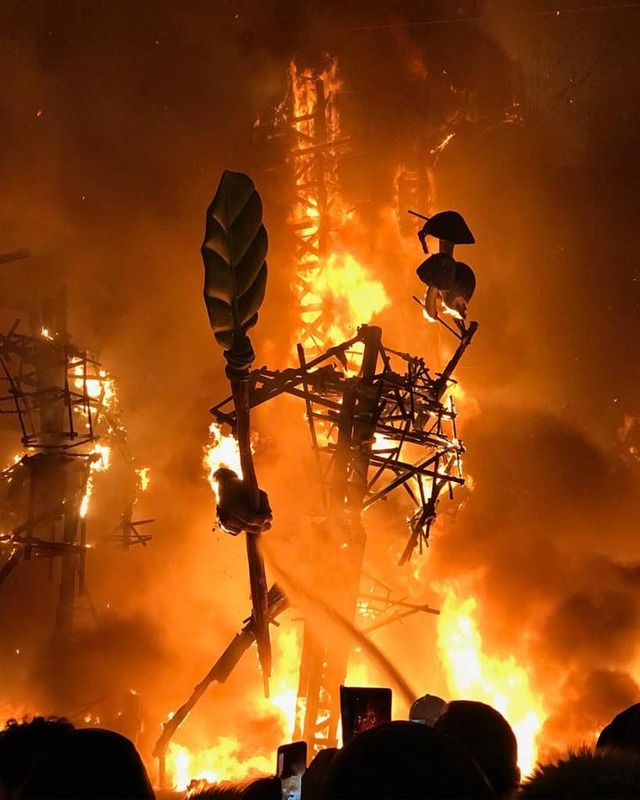 On the last day, the figures will be burnt. It is meant that everything that is bad is burnt and reborn from the ashes to welcome a new season. 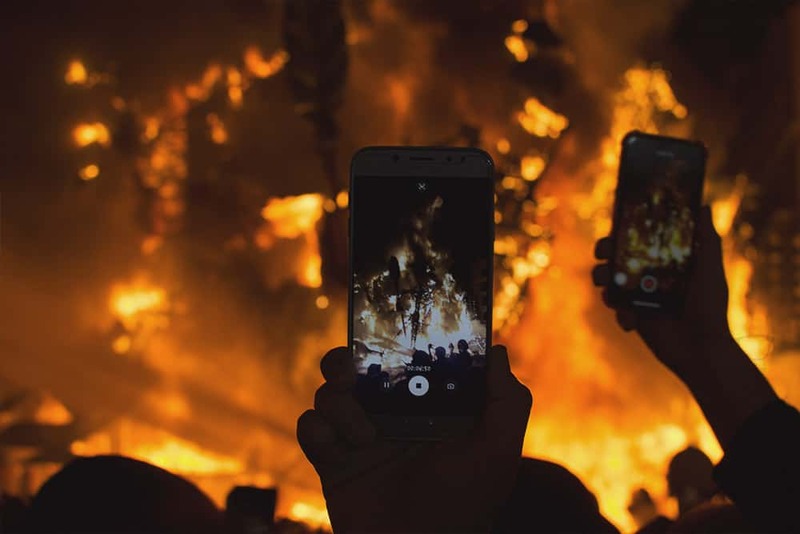 Actually, the most known and interesting part of las Fallas is watching this figures be burned, but if you like fireworks, explosions, firecrackers, and party, I would recommend you to spend the 4 days that this festival last to live it at its fullest. It might come to your mind Dragons from Game of thrones, but this is very far from that. Located in the patriarca church, aka “Real Colegio Seminario de Corpus Christi”, it is said that the Valencia Dragon is kept there. 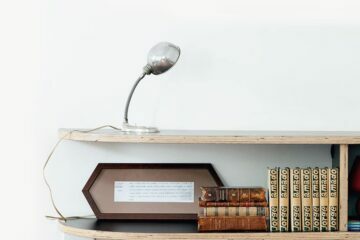 Party lovers and night owls, this section is just for you! I just summarized the best things to do in Valencia at Night. Ready to join La Movida*? *La movida is a local expression for the Spanish nightlife scene, which comes from the 80′. Go to the the restaurant cocktail bar Apotheke. 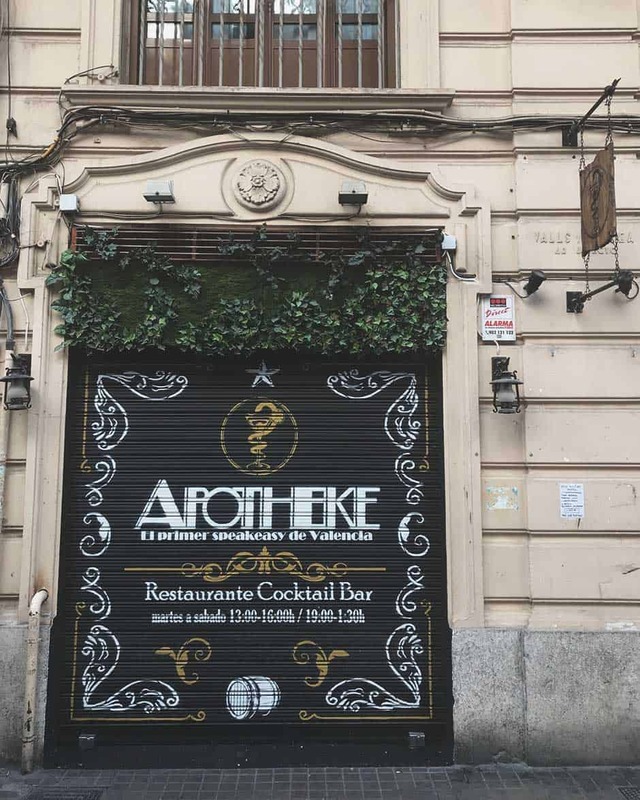 Claiming to be the one and only Speakeasy in Valencia, the decoration and vibes are very distinctive. Make sure you do a reservation at Apotheke because it gets easily fully booked. Made for the first time in 1959, Agua de Valencia is a beloved cocktail originally from Valencia. 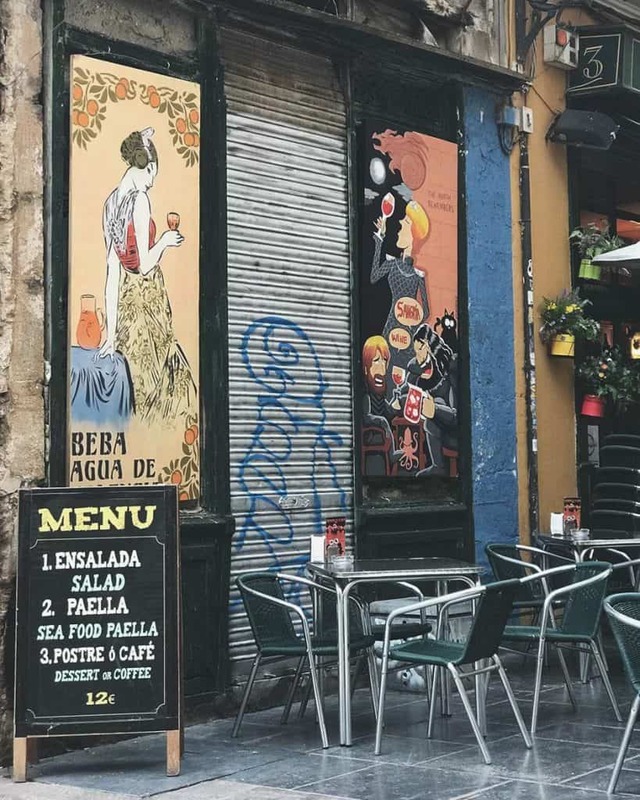 Discover a truly authentic part of Valencia ‘El Carmen’ neigbourhood and explore its nooks and crannies and be sure to try the Agua de Valencia while you eat tapas with this Viva el carmen tour. A meeting point for many people in Valencia. Cuatro Monos is a great place to go for a chilled out evening packed with good music and great drinks. Lie down on the sofas, listen good music or watch some soccer match with Ruzafa community. 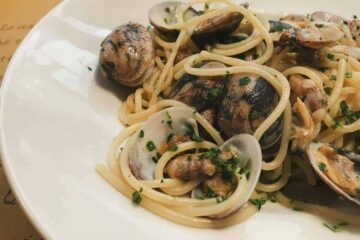 Note: they do offers food too, but make sure to reserve a table at cuatro Monos if you wanna eat. 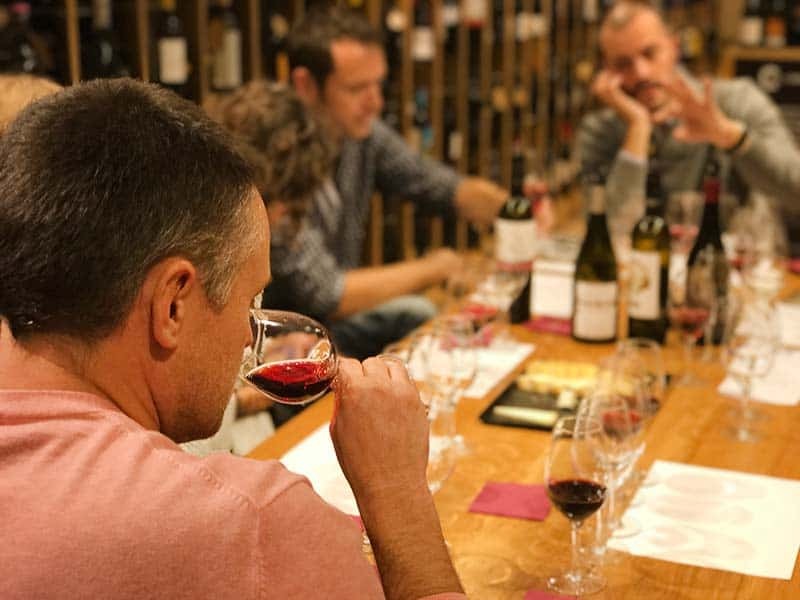 Discover the different flavors and fragrances of Spanish wine enrolling yourself at a wine tour. You will learn about the different kinds of wine, and of course taste them. That is the most funny part! Valencia is a Coast city. That means… you have the perfect setting for a boat booze party. Join the evening boat party cruise and enjoy the DJ Music while you swip Mojitos. At end the tour, you will have some tapas and at the beach! Check Jimmy Glass program in advance to know what you are listening to. As it is hard to get a table, I do totally recommend to book a table at Jimmy Glass Jazz. Still looking for more things to do in Valencia? 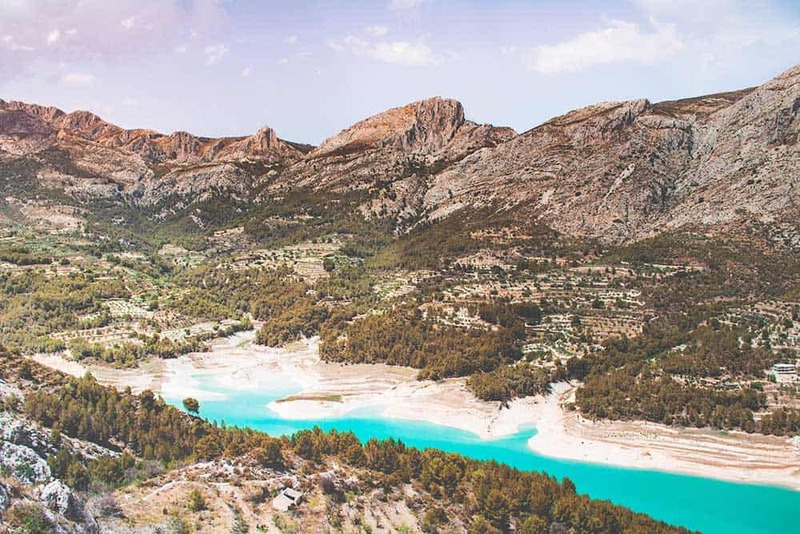 If you are up to rent a car, here you have the best things to do near Valencia. Some of them can be done as a day trip. From others, I would recommend you to stay in the area. 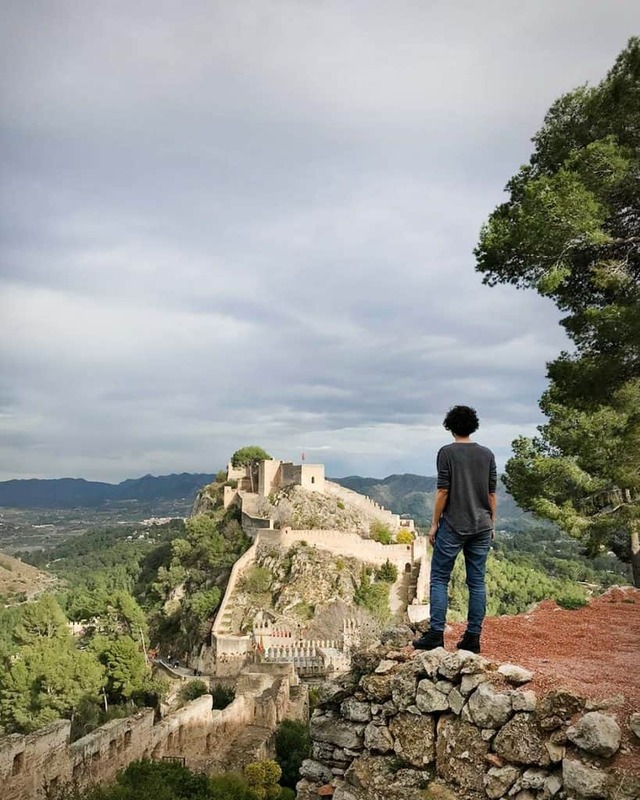 Not far away from Valencial you will find a beautiful castle, Xativa Castle. The best way to get there is by renting a car. Yes, it can be a bit challenging but believe me, it is worthy it. For less than 5 euro entrance fee you will be in a beautiful castle. Featured on the European Cemeteries Route, you will find Alcoy cemetery. True,visiting a cemetery is an unusual things to do in Valencia. But let me explain the uniqueness of this place. it is like a city of death. Alcoy cemetery is organized as a city, with streets and avenues, rich and poor neighbourhoods.. and an underground passage that will surprise you. Not so far from Valencia, in Cullera, you will find the the most emblematic historical monument of the province, the Cullera Castle. The castle is placed on top of a hill outside the town and includes also a small Church. It is an impressive fortress built over the ruins of a Moorish castle. Follow the zig-zag road to the castle and enjoy the path. The last part requires some stair climbing, but worry not, there is also an elevator. The view is overwhelming, especially towards the Atlantic Ocean. With a castle on top of a peaky rock and and amazing lake, Guadalest is considered one of the most beautiful cities in Spain. Guadalest is a small city south of Valencia. Nature lovers go there for holidays. 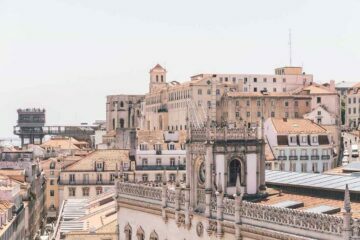 Here you have 41 beautiful cities to visit in Spain. 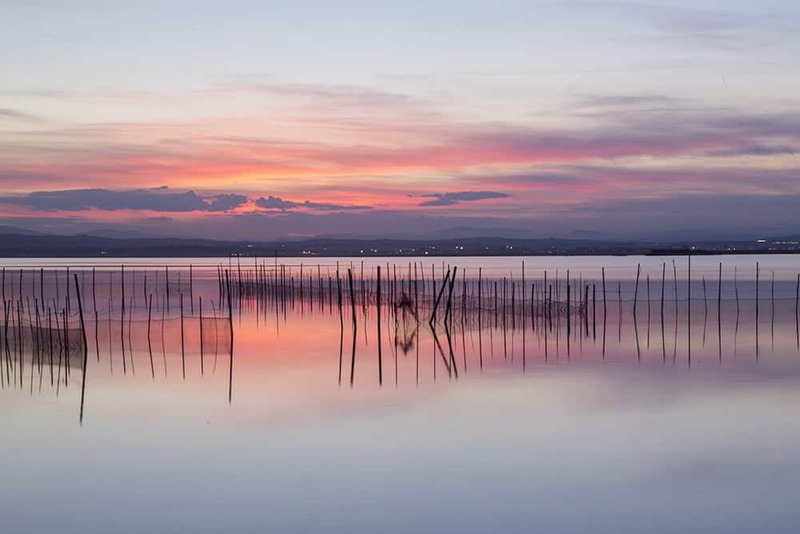 La Albufera is a Natural Park just outside Valencia. It is a perfect spot to get out of the city and enjoy nature. A great idea for a day trip. If you don’t really wanna go alone and fancy to ride bicycles, join an Albufera bike tour. During this tour, you will explore Albufera by bike on this tour from Valencia. Discover the city’s natural lagoon and try an unmissable local delicacy — paella. Note: Bring your sun glasses and a hat to get protected from the sun. Better if you apply suncream before leaving (even during winter time the sun is powerful). Located on the mountains, this small beautiful village is home of one of the most strange caves in Spain, Ses covetes des Moros. Until today, they did not discovered the real purpose of these caves. Bocairent has less than 4000 inhabitants and not many international tourists visit it. Perfect place ot practice your Spanish skills. 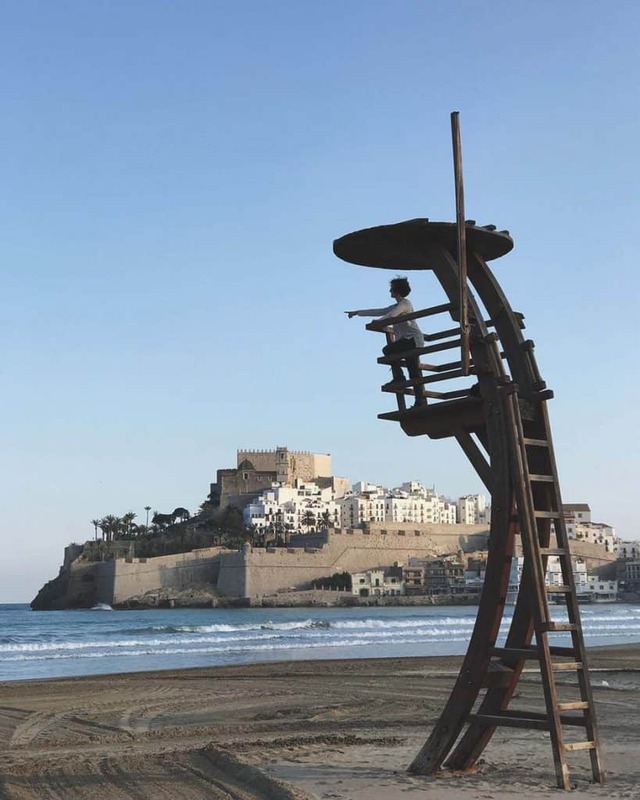 Known as a touristic destination in the Valencian Spain due to its beach and beautiful castle, Peñíscola is also the Meereen set for Game of Thrones. Walk around the castle, recognize the places and picture yourself at the iron Throne. The subterranean river of the Grottoes of Sant Josep is a natural cave located in Castellón. Concretely, you will find them in Vall de Uxó. Active upweling developed in limestone, amazing scenery and crystal clear river water. Sant Josep Grottoes is the longer river inside a cave in Europe. You will be on a boat ride along more than 8 kilometers, water is maximum 2 meters deep, so you can see everything! A unique experience. 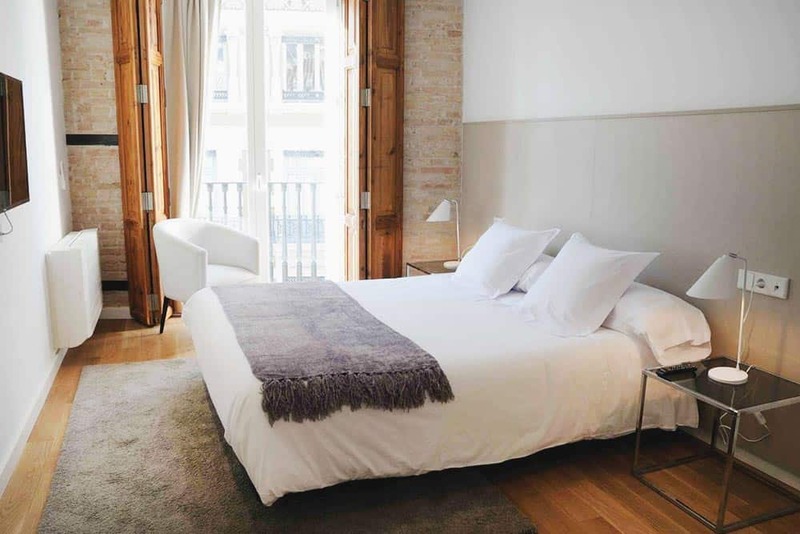 Now that you discovered what to do in Valencia, you might ask yourself where to stay in Valencia. 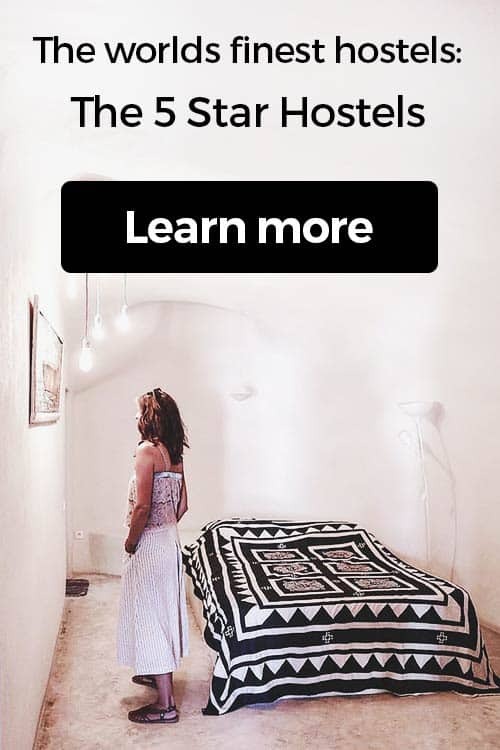 I would definetly recommend you to stay in the city center. Why? 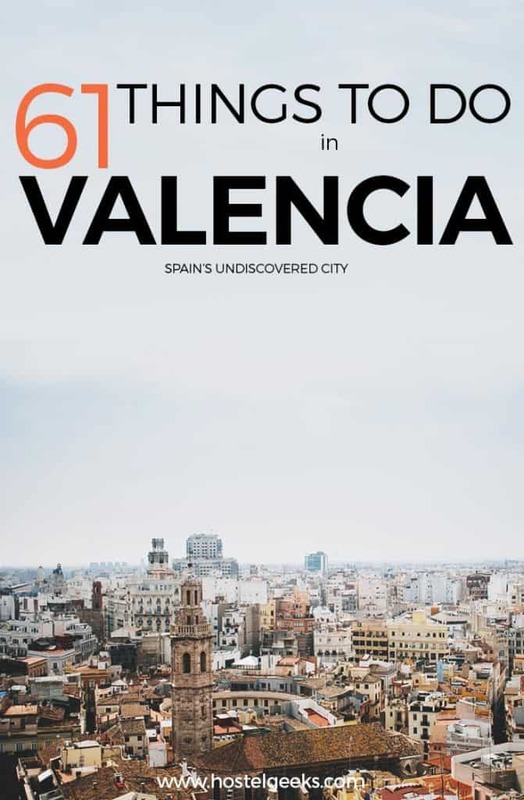 Cause you will be able to see and experience Valencia easily and reach almost every mentioned places just by walk. Located in the old town, this 4 Star Hotel will provide you not only a central location but also clean, spacious and elegant rooms. Breakfast is offered an extra cost. 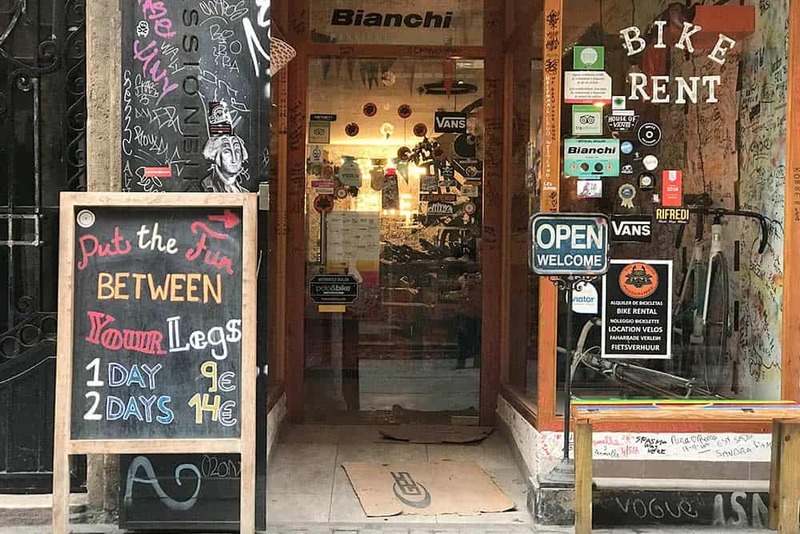 I do recommend you to check the nearby cafes as you will find better deals. The hotel is in a walking distance to shops, restaurants, cafes. The train station is also nearby. 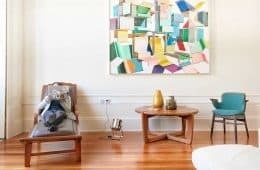 If you are traveling in a group of people, a covinient way to stay in Valencia will be in an appartment. Valencia Flats San Martin has a great location and offers comfort. There are many things to see in Valencia, and fun parties to experience. Are you ready to join Tomatina or las Fallas? Or would you prefer to walk around Malvarossa beach and just take time to enjoy and taste the Spanish culture? You can do both on this Spanish city, you just need to check the party dates in order to join/ avoid them. Here you have approximate dates, but please check them to be 100% sure. Las Fallas : around 19th of March, being the 19th of March the last day where the Fallas are burnt. La Tomatina: last Wednesday of August. Here you have the map with all the Valencia points of interest, the day trips, and the accommodations that we recommend. You can use this map offline if you save it on your cell phone. And if you have date, with this map you can easily move around Valencia city and surroundings. 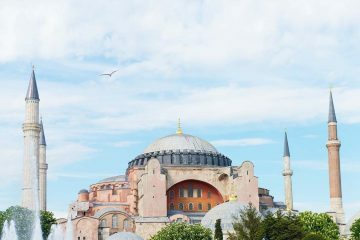 5 Local Things To Do in Istanbul – No tourist guide!